kitchen. Has sensational new patented features not found on any" other teakettle at any price. Overcomes troublesome faults found in ordinary teakettles. Saves steps, fµel, time and bother. First teakettle with a self-opening whistle. An amazing new feature for added convenience. First teakettle with a water gauge. A useful, practical feature that you're sure to like. First teakettle scimtifically designed for Jaster heating. Saves time and fuel for you. First teakettle with scientifically designed cool handle. is insulated, has cool plastic grip; flaring sides of kettle deflect heat away. So durable that it should last a lifetime. against dents from banging. Also the kettle has no spout to dent. 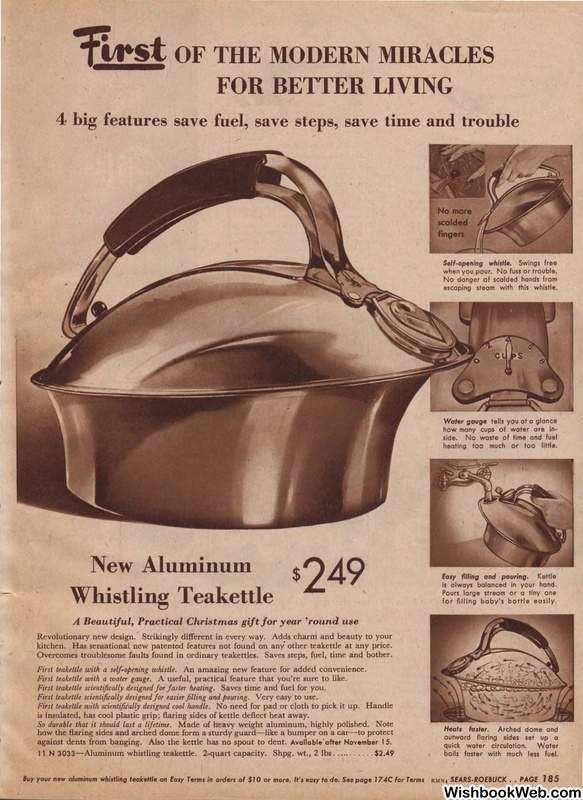 3033-Aluminum whistling teakettle. 2-quart capacity. Shpg. when you pour. No fuss or trouble. escaping steom with this whistle. heating too much or too little. boils foster with much less fuel.